To bid early or absentee for our auction, read on for instructions and a list of items. More items will be posted every day, so check back! Sealed bids for the auction will be accepted until Friday evening 4/20 at 6:00 p.m. via email. To bid on an item you see here, please email the item number(s), along with your bid(s) to teachboosterclub@gmail.com As an absentee bidder, you will not have the opportunity to raise a bid amount based on live bidding, so please indicate your best offer in your email bid. Please remember that a bid is your promise to pay for and receive the item if yours is the highest bid. All items must be paid for and picked up at Teach Elementary, 451 Jaycee Dr., no later than April 30, unless other arrangements are made. If your silent auction bid is the highest, you will win the item for your bid amount. If another bidder has bid higher than you, you will not win that item. If there is a tie, the bidder present will win the item. Live auction bids will be announced during the course of the live auction. A live proxy bidder will submit live auction absentee bids. Bidders are assigned a bidder number, and all bids are private. Live Auction items are listed first, followed by Silent Auction items. Take a moment to peruse the attached list of auction items. It lists the live and silent auction offerings, and there are quite a few. They skip around, so give them all a quick skim – there might just be something in there that you’ve been looking for recently or something you didn’t know you couldn’t live without! Be sure to email this list to family and friends-anyone can bid! 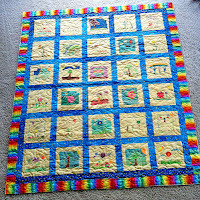 This classroom project used quilt creativity. Each student created a quilt square in the theme of flowers and plant life. 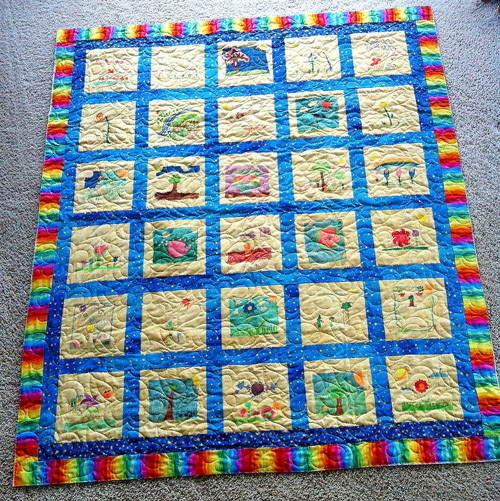 This beautiful quilt has 30 handmade squares in which Victoria Rice, Riley McConnell's grandmother, has donated her time and sewing abilities to assemble for the class in a finished handmade quilt of about 55 inches x 65 inches. Created and donated by Mr. Crabb’s 4th grade class. Relax on your porch with a glass of lemonade and watch the grass grow in this one of a kind Adirondack chair. Hand painted by the students, this chair is the perfect Father's Day or Mother’s Day Gift and would look beautiful in your back yard or the Teach School garden. Created and donated by Mr. Cyr’s/Ms. Hargrave’s 5th/6th grade class. This classroom project used the students’ gardening skills in addition to their art skills, by creating portable gardens in two wine barrels. The wine barrels are cut in half and hand painted by the children. Each of the two barrels has a different planting theme. One is a "Salsa Garden" and the other is a "Pizza Garden." Created and donated by Ms. Robson’s 4th grade class. Large photo stretched on canvas of Ms Kelly’s class. This will be an artistic expression of the collective personalities and signature talents of this amazing group of kids. Created and donated by Ms. Kelly’s 5th grade class. Graffiti Art Worth Hanging Up! An eclectic blend of designs married into an inspiration piece of art. This one-of-a-kind stylish art piece will funkify any home. Created and donated by Mrs. Jones' 6th Grade Class. Donated by Dr. Grace Kim of Rejuvenation. Value $1600. 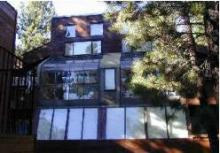 End you summer vacation relaxing for 7 nights in Mammoth Lakes, California. This timeshare condominium townhouse sleeps 6 people and features all of the comforts of home. Mammoth is a great economical, family-friendly place to play. Discover nature with hikes to Devils Post Pile, exploring Mono Lake’s Visitor Center, fishing and kayaking on the many lakes, and horse back riding. Donated by the Gonzalez Family. 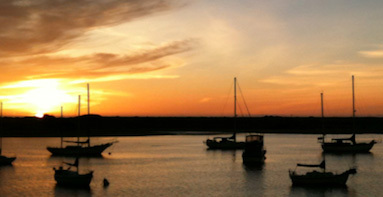 Includes Kayak Rental and Restaurant Gift Certificates valued at over $225. The perfect luxury nightlife excursion! This suite sleeps 2-4, and is ideal for couple’s getaway or a ladies’ weekend. This item includes 2 nights’ stay in this beautiful suite. The suite offers a king size bed and queen pull-out in the living room. Take a long weekend and live it up in style! Both elegant and trendy, the MGM Grand Las Vegas is one of the premiere hotel and casinos on the Las Vegas Strip. Its excellent location is close to McCarran Airport and top hotels like NY NY, Tropicana and the Monte Carlo. 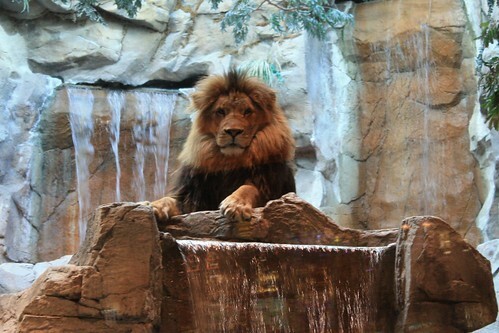 Not only is it close, but there is so much to do at the MGM Las Vegas that you may never want to leave! The MGM Las Vegas really captures the spirit of Las Vegas entertainment. Where else can you find big boxing events or the hottest performers and shows? From large performances to intimate settings, the MGM is your ticket to Vegas entertainment. The MGM Grand Las Vegas is also your destination for a relaxing vacation. The Christophe Salon is a great destination for beauty services. The MGM Grand Spa and fitness center will rejuvenate your spirits and leave you feeling at peace. If that wasn’t enough, the MGM has five outdoor pools with a lazy river that is surrounded by tropical gardens. Spend an afternoon poolside under the warm Las Vegas sun. Donated by Bill and Cathy Gray. Value $800. 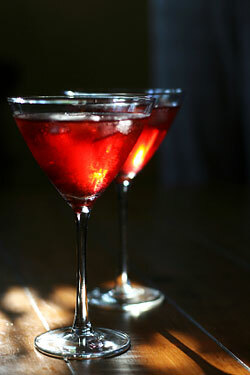 Invite seven of your friends for an evening of cocktails! Matt Wormley will give you your party a personal "mixology" lesson of three cocktails of your choice. Then you will relax and enjoy an evening of appetizers and drinks at an elegant Arroyo Grande estate. Item includes cocktail party for 8 with 3 drink recipes and appetizers. Donated by Matt and Kimberly Wormley. Can't see yourself wearing glasses anymore? Say "goodbye" to glasses and contacts forever! 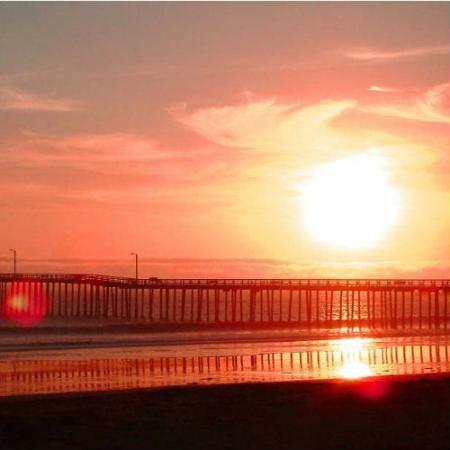 Pacific Eye offers top-quality, comprehensive care on the central coast. At Pacific Eye, advanced technology is used for optimal results. IntraLase Custom LASIK represents a significant innovation in LASIK surgery, which offers improved safety, comfort, and results. IntraLase LASIK - also called all-laser LASIK - combines IntraLase laser technology with VISX laser technology for a highly customized, blade-free vision correction procedure. See Life. See Adventure. See Family. www.paceyemed.com Patient must meet the eligibility requirements for the surgery. Money back is guaranteed if you are determined to not be eligible and the surgery will be offered to the next highest bidder. Offer expires one year from date of purchase. $5000 Value; Donated by Dr. Adam Abroms and Pacific Eye. Looking for a little getaway? Shopping for the perfect anniversary present? This one is sure to be a well-received gift! Hotel Corque is a place of casual elegance and superb hospitality. You are bidding on one night's lodging in a deluxe guest room with a continental breakfast. The luxurious, custom guest rooms are beautifully designed to offer the ultimate in comfort and relaxation. 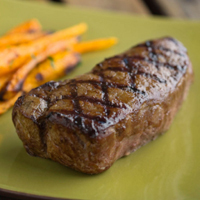 Also included is a dinner for two gift certificate to Root 246. The winning bidder will truly enjoy one of the most unforgettable dining experiences in Solvang. Created by world-renowned celebrity chef Bradley Ogden, Root 246 offers a full menu of his signature farm-to-table cuisine and one of the most extensive selections of local wines. Finish the package with a few noteworthy accessories for your trip including a gorgeous wine accessory kit in a burlwood box, and a pretty basket purse, scarf and hat for the lady. $400 value; Donated by The Santa Ynez Band of Chumash Indians, The Overland Family and Denise Tauler. Bid to win your favorite horse, then cheer him on in our dicey horseraces! Horses are donated by local artists: Katherine Pardeilhan, Susi Griffiths, Leslie Rugebregt, Ann Wright, Kathy Salas and Bonnie Johnson. 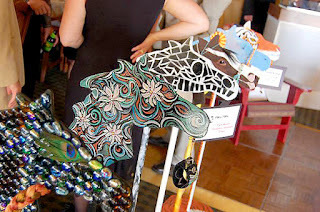 Everyone will have the opportunity to bet for fun on our beautiful creations - whose horse will win?? Will it be yours? Traditional trash-talking by owners and jockeys prior to the race is encouraged. It's all in good fun and all for a great cause! Greased Lightning Designed by local artist and color consultant Catherine Pardeilhan. What could be faster than greased lightning? Put your money on this winner. Greased Lightning comes with - what else? The soundtrack to the movie Grease. Not only is this a great production, it's our 6th grade play this year. Why not refresh your memory of all those great songs in preparation for the play? Greased Lightning also includes Cruisin' with Crabb. This is one ride not to miss! Your child gets to go for a joy ride in Mr. Crabb’s 1957 hotrod truck. 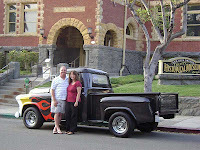 “Rock around the clock” and enjoy lunch in SLO at Cool Cats Diner with Mr. and Mrs. Crabb and one of the child’s parents. Whoever wins this one will be the coolest parent at Teach! Donated by Catherine Pardeilhan, Boo Boo Records, Mr. and Mrs. Crabb and Cool Cats Diner. A Horse With No Name Designed and painted by local artist Susi Griffiths. For your ride through the desert. This one has plenty of heart! Includes Mata Traders Moulin Rouge Earrings and a Buffalo Turquoise Flower Bracelet & Ring of polished halite flowers with gold-plated wire settings ($266 value). Modern and lovely. http://www.etsy.com/shop/WesternSunset Donated by Susi Griffiths and Denise Tauler. King Charles Designed and painted by Leslie Rugebregt of The Good Flea. Named after our school's namesake, Charles E. Teach, you know this steed is a winner. Also included is the most-adorable Tiger Pillow Pet ($25 value) and a beautiful amber necklace. Amber has been prized for its color and natural beauty since neolithic times. Warm-to-the-touch amber gems are believed by some to possess healing properties. This lovely tapered necklace is 25" total length and fastens with a gold clasp ($145 value). Donated by Leslie Rugebregt, Hamilton Estate Jewelry and Pillow Pets. Devil's Fire A beautiful, glass-encrusted black stallion from the creative mind of stained-glass artisan, Ann Wright. Devil's Fire is bridled with a one-of-a-kind necklace valued at $100 from vintage jewelry artisan Paige Peake Wright. Donated by Ann Wright and Paige Peake Wright. Bejeweled Designed and hand-painted by Shell Beach artist and stylist Kathy Salas. Bejeweled is a merry-go-round inspired creation that comes with a $50 haircut and style from the artist herself. Bejeweled also includes a unique bracelet and pendant earrings set in soft gray agates, accented with sterling silver flowers. Stylish and of-the-moment color and style ($25 value). Donated by Kathy Salas and Denise Tauler. Ulani the Hawaiian Unicorn. Designed by local art teacher Bonnie Johnson, owner of BonJon Art. Ulani comes with a $20 gift certificate to BonJon Art, dedicated to providing high-quality instruction for elementary age children through adults. Classes are themed according to subjects that interest young artists and difficulty is based upon specified age groups. Class schedules can be found at www.bonjonart.com. Ulani also includes a family pass to the Ty Warner Sea Center or Santa Barbara Natural History Museum and a set of children's books. Donated by BonJon Art, the Santa Barbara Natural History Museum and the Moore Family. Item #101: Great America (2) and Gilroy Gardens (2) Admissions California's Great America, located in Santa Clara is home to not-to-miss thrill rides like Flight Deck and The Vortex! If slower speeds are for you, the family rides like the Carousel Columbia or Barney Oldfield Speedway will be perfect. Also within Great America is Boomerang Bay water slide park. http://www.cagreatamerica.com THEN spend a day of fun up in Gilroy! Amusement park rides and beautiful gardens to entertain you and your family. www.gilroygardens.org $210 value; Donated by Gilroy Gardens and Great America. Item #102: Hearst Ranch- “Where’s the Beef” Two bottles of Hearst Ranch wine - one 2009 Temperanillo and one 2010 Rose of Temperanillo, only made last year as a special fundraiser for the Hearst Cancer Resource Center, a package of Hearst Ranch beef jerky, and a $100 gift card for Hearst Ranch beef. http://www.hearstranch.com Donated by Shields and Robertson Families. Item #103: Santa Barbara Zoo Overnight Package Your next staycation could be in Santa Barbara! This package includes a $200 certificate to a Best Western Hotel, 2 passes to the Santa Barbara Zoo, and a family pass good at the Santa Barbara Natural History Museum or Ty Warner Sea Center. $260 Value; Donated by the Santa Barbara Zoo, Santa Barbara Museum of Natural History and the Naran Family. Item #109: Dog Lover A Wag More Bark Less Gift Basket FILLED with dog treats, t-shirt and other doggy delights. Plus, send your favorite doggy to camp at Thousand Hills Pet Resort with Doggy Day Care for 5 days. www.thousandhillspetresort.com Your dog will thank you! $220 Value; Donated by Cloud Star Foundation and Thousand Hills Pet Resort. Bringing it together—seamlessly. TV, Web, Android apps - Seamlessly integrated on the best screen in your home—your HDTV. That's Logitech Revue with Google TV. With Logitech Revue — powered by Google TV — bringing it together is seamless and simple. With Logitech Revue, you can watch TV, surf the web, download apps from the Android market or make a video call with Logitech Vid (camera not included). Logitech Revue works with popular cable providers, satellite services and DVRs. Logitech Revue with Google TV makes it easy to search for what you want to watch with the TV and Movies search application. It also makes channel surfing better with an improved programming guide. Logitech Revue with Google TV delivers improved browsing to the biggest screen in your home, with the power of Google Chrome and Adobe Flash (version 10.2). With built-in Picture-in-Picture, Logitech Revue takes multitasking to your HDTV. Now, there's no reason to flip back and forth—or to miss a second of the action. It happens on one screen, at one time. Logitech Revue doesn't just bring the Web to your HDTV. With Google Chrome, it also gives you an easy and quick way to navigate the Web thanks to its full-size keyboard controller. Revue with Google TV and Android 3.1 gives you access to the Android Market—and is optimized for your large screen TV—so you can search and download the growing number of Android apps built for Google TV. With the Logitech Media Player software and your Revue, you can unlock the library of music, movies, and photos stored on your computer and enjoy them on your HDTV. Visit Logitech for more information at http://www.logitech.com/en-us/smartTV/revue. It comes together in one place. Donated by Julie Mamo-Beckius. Value $200. Item #113: SLO History Buff Set of three books of San Luis Obispo History, a set of cards and a Framed Photo, signed by the author. Donated by Guy Crabb. 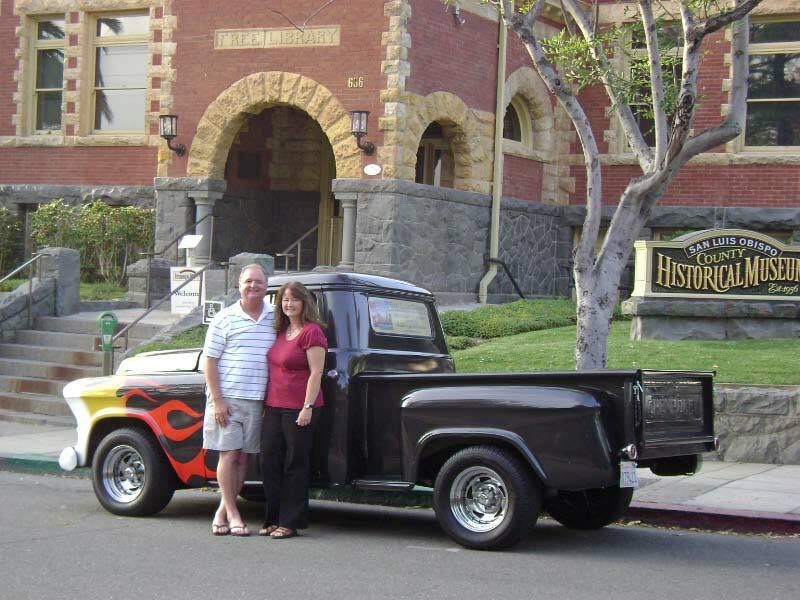 75 SLO City Sites; This informative book, signed by the authors, is a self-guided architectural tour in historic San Luis Obispo. 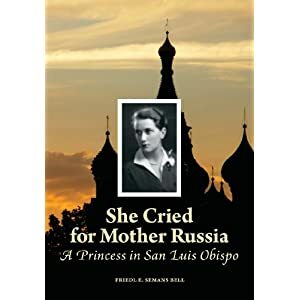 Donated by Verena Von Engle She Cried for Mother Russia: A Princess in San Luis Obispo; Book signed by author Friedl E. Semans Bell. Russian princess Tatiana Volkonsky narrowly escaped death from marauding Bolsheviks after the Russian Revolution in 1917. Traumatized by the horrors of her flight, she was unable to share her painful memories before beginning a new life in San Luis Obispo, California. In 2005, twenty years after her death, documents were found that unlocked the mystery of Tatiana's unspeakable past. The author pieces together her friend's extraordinary journey and subsequent life as a refugee in a tribute to this remarkable Central Coast resident. This book often references our school namesake Charle E. Teach, as he was a frequent dinner guest. Donated by Author Friedl E. Semans Bell. Party to include sundae bar on a freight train, invitations, balloons and decorations. They take care of all of the clean up! Donated by Central Coast Family News. Item #115 The Golf Lover's Basket Enjoy golfing in beautiful San Luis Obispo with golf for for four on the lush fairways of the San Luis Obispo Country Club. Next, treat a friend to 2 rounds of golf and a cart at Laguna Lake Golf Course. Stay organized at work (even while you're golfing) with a sleek leather 8 1/2 x 11" Padfolio. $425 Value; Donated by San Luis Obispo Country Club, Laguna Lake Golf Course and the Overland Family. Item #116: Garden Fresh Take home a bountiful basket of local fruits and vegetables plus get 2 deliveries directly to your doorstep. Yummy! 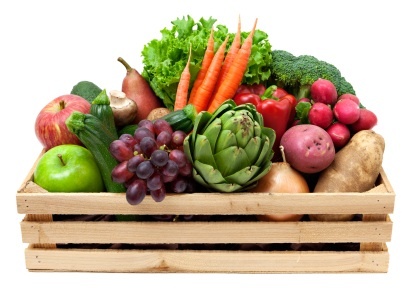 As if that wasn't enough, enjoy more fresh, local produce with a gift certificate for two weeks of produce box deliveries. www.rutizfarms.com $165 value; Donated by Rutiz Family Farms and SLO Veg. Item #117: Dance! Dance! Dance! Hip Hop or Ballet – Four Dance lessons for an adult or child at Dance Obispo, a beautiful premier dance studio located in downtown SLO. Carry your dance shoes in a handy dance bag from The Dance Shop. Donated by Dance Obispo and The Dance Shop. Value: $62. Located between Santa Maria and Pismo Beach, Blacklake Golf Resort is the Central Coast's only 27 hole golf resort. Enjoy the unspoiled natural beauty of this unique championship golf course with 2 rounds of golf, complete with a golf cart. Also enjoy 2 rounds, complete with a cart, at the Laguna Lake Golf Course, our local public course. $156 value; Donated by Blacklake Golf Resort and Laguna Lake Golf Course. Item #119: 90 Minute Full-Body Massage w/Detox Body Wrap on the new Biomat at Healing Bliss Home Studio. This massage includes hot steamed towels for face & feet, aromatherapy, reflexology, accupressure using only the finest organic essential oils, Swedish, deep tissue, myofascial release and more! Wouldn't this make an excellent Mother's or Father's Day gift? For more information about bioMat, to go http://theamethystbiomat.com. Donated by Healing Bliss Mobile Massage. Value: $165. Item #120: Pilates Reformer Class + Massage Enjoy a relaxing and revitalizing day with friends at Balance Pilates Studio located in downtown SLO at the Creamery. This package includes one introductory Pilates group reformer class for up to five individuals on the amazing reformer machines developed by Joseph Pilates. The Reformer utilizes spring resistance to assist and enhance all exercises creating a truly holistic discipline that integrates thought with action. Whatever your goals may be - a longer, more flexible body, a flat stomach, excellent posture, or being in touch with your body - Pilates can help transform - tone, strengthen, lengthen - your body into the shape and feel you hope for. The Pilates method will change the way you begin to move and carry yourself each day. 55 minute session. www.balanceapilatesstudio.com. THEN treat yourself to a 1 Hour Full-Body Massage/Biomat at Healing Bliss Home Studio. This massage includes hot steamed towels for face & feet, aromatherapy, reflexology, accupressure using only the finest organic essential oils, Swedish, deep tissue, myofascial release and more. Another great Mother's or Father's Day gift! $195 Value; Donated by Balance A Pilates Studio and Healing Bliss Mobile Massage. 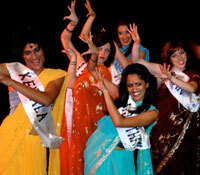 Item #122: Cal Poly Arts - Bollywood Delicious (2 tickets) and Catalyst Quartet (2 Tickets) On April 28 see America's premier contemporary Indian dance ensemble - renowned worldwide for its unparalleled artistry and commitment to authenticity and colorful theatricality - offers up an entirely new flavor with their Bollywood Delicious burlesque. A tasty tongue-in-cheek treat! (Adult Content) "Blue 13 Dance Company [pushes] the envelope [with] a little bit of Bollywood, a little bit of Hollywood, and a whole lot of soul!" ~Buzzline.com Then on May 6 seeThe Catalyst Quartet, comprised of top Laureates and alumni of the internationally-acclaimed Sphinx Competition, is committed to bringing hidden music into the mainstream. In classic CQ style, their diverse afternoon concert will deliver great big works and fresh new pieces, just waiting to be discovered. "Invariably energetic and finely burnished...playing with earthy vigor." ~New York Times Donated by Cal Poly Arts. Value: $56 www.calpolyarts.org $120 Value; Donated by Cal Poly Arts. Item 124: KSBY Studio Tour for up to 12 people! VIP Tour of the KSBY Studios in San Luis Obispo for 8-12 people. Children under 18 must be accompanied by an adult. Monday through Friday, 9 a.m. - 3 p.m. Excludes all national and state holidays. Donated by KSBY Channel 6. Item 125: 2 One-Hour Horse Riding Lessons valued at $85 http://www.millersecs.org Donated by Miller Equestrian Center & Sanctuary. Item #126 The Life Aquatic Go Fish: Take a “Journey of Discovery” and tour some of the state’s premiere aquariums with this fantastic bundle of family fun. Walk through the world’s largest ocean at the Aquarium of the Pacific in Long Beach with these two passes valid 4/1/12 – 10/31/12. www.aquariumofpacific.org Enjoy amazing animals, shows and rides situated on nearly 200 acres of world class theme park terrain at Sea World San Diego with admission for four. http://seaworldparks.com/seaworld-sandiego Complete the trip with a family pass to the Ty Warner Sea Center or Santa Barbara History Museum. $380 Value; Donated by SeaWorld San Diego, The Aquarium of the Pacific and the Ty Warner Sea Center. Item# 127: “Best of California” Garden and Succulent Wreath Your garden will be showcase ready with two hours of private consultation with “Best of California” award winning landscape architect, Jeffrey Gordon Smith. Also enjoy perusing the pages of his recent book which captures an extraordinary collection of residential landscape designs frequently photographed by Sunset magazine. 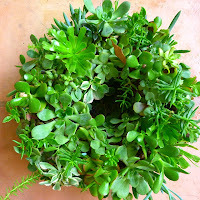 For the garden lover, this Living Succulent Wreath is also included. This beautiful wreath is the perfect accent to any home. Succulents are hand-assembled into this enchanting living wreath. A unique gift of the garden. www.jgsdesigns.com Value$470. Donated by Jeffrey Gordon Smith and Verena Von Engle. Item# 128: Say Cheese: Make the moments last with Tom Meinhold Photography. Enjoy one photographic session, good for a family or individual sitting, plus an 11x14 portrait on canvas that will capture a moment to remember. www.perfectphoto.com Value$355. Donated by Tom Meinhold Photography. Item#130: The “Reel” Deal Dinner and a movie: Head out to see the next Oscar winning performance with passes to the Royal Theater. Afterwards, be a guest of California Pizza Kitchen with two complimentary entree and soft drink certificates. And don't forget dessert with a $10 gift certificate to Bali's Frozen Yoghurt. $52 Value; Donated by California Pizza Kitchen, Bali's Frozen Yoghurt and Denise Tauler. Item #131: The “Eyes” Have It Primary Eyecare Center of San Luis Obispo provides more than meets the eye with this basket filled with eyecare supplies and products. A gift certificate for an eye exam by Dr. Quyen Immoos is included, because Primary Eyecare Center cares how you see them. www.sloeye.com Value $200. Donated by Dr. Quyen Immoos, OD of Primary Eyecare Center. Item #133 Roll out the Barrels + Per Bacco SLO Vitners Harvest Festival, 2 admissions. What an amazing combo mom/dad’s day gift! www.slowine.com And since we know you love wine, how about a Case of Per Bacco Wine? Includes six bottles of Edna Valley Chardonnay and six bottles of "Rosseto" Proprietor's Blend, created by winemaker/owner Craig Shannon of Arroyo Grande Pinot Noir and Paso Robles Syrah. The 2008 Edna Valley Chardonnay is a Silver Metal Winner from San Francisco Chronicle Wine Competition 2012. The 2008 "Rosseto" Proprietor's Blend is a Gold Medal Winner from the Central Coast Wine Competition 2011 (and pretty yummy, if I do say so myself!). This mixed case has a retail value of $306. www.perbaccocellars.com $416 Value; Donated by the Rizzo Family and SLO Vitners Association. Item #134: One Hour of giftedness consultation and book. Perfect for a Teach family! www.annettesheely.com $320 Value; Donated by Annette Sheeley. Item #135: Justin Wine Tasting + Zippity Doo Dah...Zipline Adventure Plan a lovely summer day! Start with two Zipline Adventures to soar over Ancient Peaks Vineyards! Embark on four distinct ziplines spanning more than 3,000 total feet, starting with an epic 1,300-foot valley crossing and finishing with forested vineyard views; followed by a tour of one of the most historic ranches in the region and a wine tasting. http://www.margarita-adventures.com/ THEN Tasting for 4 at Justin Vineyards. www.justinwine.com $260 Value; Donated by DeAnn Oliver and Margarita Adventures. Item #136: Pismo Beach Theater Getaway Enjoy some rest and relaxation with two nights in an ocean pool view room at The Cliffs Resort. This stay excludes Saturday stays, holidays and select blackout dates. http://www.cliffsresort.com $400 value; Donated by The Cliffs Resort. While you're out enjoying yourself, why not catch a show? This item also includes 2 PCPA tickets to Theaterfest. www.pcpa.org Also included are 2 tickets to the Great American Melodrama. At the Great American Melodrama and Vaudeville, theatergoers are welcomed into a comfortable atmosphere of cabaret tables with sawdust on the floor and honky-tonk piano music in the air. The Great American Melodrama has been providing professional family entertainment for over 35 years. www.americanmelodrama.com $500 Value; Donated by Great American Melodrama and Vaudeville, PCPA Theaterfest and The Cliffs Resort. Item #137: Round Table Pizza Party Package The ever-popular pizza party! You know it's what your kids want. 2 hours, 4 pizzas, 20 sodas, 80 tokens. Value $80; Donated by Round Table Pizza. Item #138: Sports Fan Cheer the home team with 2 tickets as Cal Poly brings in another win for Mustang Softball! Go Mustangs! This item also includes 2 tickets each to two CalPoly Baseball games. Then cheer on the Tigers! SLO High passes to any high school sporting event, excluding playoffs & championships. 2 passes, each for 2 people. $54 Value; Donated by San Luis Obispo High School Athletics, Molly Overland and CalPoly Athletics. Item #190: Pops By The Sea Enjoy great music outdoors by the ocean in beautiful Avila Beach. Bring your gourmet snacks and enjoy the great wines available to purchase. Includes 2 tickets for Labor Day, bring the kids along - their admission is free! This item also includes a one-hour music lesson, complete with registration. www.slosymphony.com Donated by the San Luis Obispo Symphony. Item #140: Horse Care Basket Keep your horses groomed and happy with this collection of equine care products, including fly control and horsey hair-care products for a healthy, shiny coat. $125 Value; Donated by Farm Supply. Item 142: Golf Performance Evaluation Would you like to play better golf? Understand how your body affects your golf swing. There are 14 areas of the body that require golf-specific conditioning. Learn how each area relates to the golf swing and how to improve using your evaluation results. What's holding you back from your ideal swing? Dr. Jeff Blanchard has combined his unique practitioner expertise (32 years in private practice) with his actual play experience as a competitive golf professional (career low round of 62) to offer his patients/students a more complete understanding of how to improve on the golf course. www.eGolfInjurySeminars.com $250 value; Donated by Dr. Jeff Blanchard. Item #150: Diva for a Day Spa Party for Girls The spa comes to you with this Diva for a Day spa party! Perfect for birthday parties or special days and customizable for age 5 through teens. Treat your girl and her friends to hair, makeup and nail treatments in a vintage Oasis Travel Trailer. Also included in this fit-for-a-princess package is the famous Madonna Inn Champagne cake! Entertainment and dessert are all taken care of for your girl’s special day. 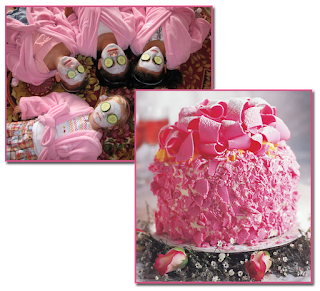 Package includes Diva for a Day Spa Party for 8 and one 10” Champagne Cake (serves 12-22). Candice Cleary is a licensed aesthetician and does all treatments in her beautiful mobile spa. Donated by Candice Cleary of Princess Parties and The Madonna Inn. Value $300. Item #156: The Perfect Present It’s Your Choice: Ten Beautifully Wrapped Packages with Homemade Professional Bows delivered to your home -OR- Professional Bow Making Lessons for up to Ten People. Item #171: Family Fire Station Tour + Pizza Party Tour the San Luis Obispo Fire Station #1. One lucky family is invited to...tour the fire house, slide down the pole and go for a ride on the ladder truck! This item also includes a gift certificate to the SLO Donut Co. for a fun morning out. THEN invite your friends for a Round Table Pizza Party! The two pizza certificates included add up to 4 large one topping pizzas, 20 sodas and 80 game tokens plus the party room for two hours. $150 Value; Donated by Round Table Pizza. Item #151: Art Nouveau Swan Pendant Necklace Met Museum Shop; based on an original pendant by Marcel Bing. 24K gold overlay with a simulated pearl. Value $175; Donated by Denise Tauler. Item #152: Archaic Greek Earrings Met Museum Shop; based on an original earring, ca. 650-600 B.C. 24K gold overlay. Value $65; Donated by Denise Tauler. Item #153: Pearls These pretty Coin Pearl Earrings from the Met Museum Shop are adapted from a pair of Chinese Tank Dynasty hair pins, 7th-8th century A.D. Sterling silver plated with gold, inset with freshwater pearls. 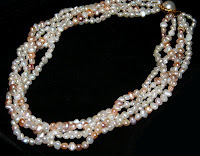 Why not make it a set with this Freshwater Pearl Necklace? Pearls are always the elegant choice. This pretty milti-strand necklace of freshwater pearls has 5 strands in all, fastened with a gold plated clasp. In a variety of creamy colors, these unique pearls are durable and beautiful. $195 Value; Donated by Hamilton Estate Jewelry and Denise Tauler. Item #157: Art Deco Multicolored Jewelry Set Sparkling multicolored gems in a basket design are trimmed with hematite. Matching necklace and pendant, ring and earrings. Genuine gemstones and sterling silver. $760 value; Donated by Denise Tauler. Item #181: Agate Bracelet & Pendant Earrings ; Donated by Denise Tauler. Item #155: Thai Ivory Bracelets Hand-carved ivory elephants and fish on ivory-bead bracelets with a unique screw-clasp. Set of 2. $90 Value; Donated by Denise Tauler. Item #159: Sea Glass Bouquet Pendant Necklace Katie Carrin. This elegant small bouquet necklace features lavender sea glass, freshwater pearls and amithyst. Each of these beautiful bouquet necklaces are created by hand using genuine rare sea glass from the North Sea in England. The pearl and gemstone bouquet hangs from a sterling silver chain. The necklace is finished with a sturdy lobster clasp wrapped into the necklace with genuine freshwater pearls. Item #160 Lindamood Bell Diagnostic Evaluation Education is a life-long treasure. Don't miss this opportunity for a Comprehensive learning ability evaluation and consultation with Lindamood Bell. In a consultation, strengths and weaknesses are explained, and a diagnosis and instruction plan offered. Recommendations are given for the type and duration of instruction. www.lindamoodbell.com $650 Value; Donated by Lindamood Bell Learning Processes. Item #162: Sue Hogan Necklace + $40 Finder's Keepers Gift Certificate Wear this beautiful stone necklace from local designer Sue Hogan out on your next shopping trip. A $40 Gift Certificate to Finder's Keepers Designer Consignments gets you started. Dare to be as fabulous on the outside as you are on the inside! www.finderskeepersconsignment.com $105 Value; Donated by Finder's Keepers. Item #168: Family Fun Start off with a "kids' day" in downtown SLO. This item includes four passes to the SLO children's Museum, plus a $20 gift card to Powell's Sweet Shoppe. Head out of town to see the Avila Sea Life Center (4 passes). Have you been to this new local museum yet? A great summer destination when the kids are whining there’s nothing to do! 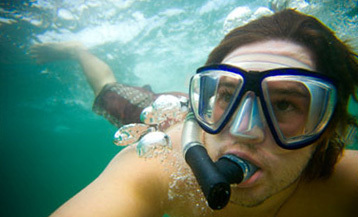 www.sealifecenter.org And to complete the package, a family pass to the Santa Barbara Natural History Museum or the Ty Warner Sea Center. Don't forget game night - the award-winning game Quarto is also included. That oughtta keep those kids entertained! $152 Value; Donated by the Avila Sea Life Center, The San Luis Obispo Children's Museum, Powell's Sweet Shoppe, the Santa Barbara Natural History Museum and Whiz Kids. Item #169: Stanford College Football vs. San Jose State Cheer The Cardinal as they fight for victory against San Jose State in the first Pac-12 game of the season. 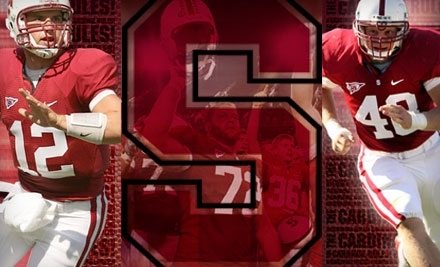 4 tickets on the 45 yard line to the Saturday, September 1 game at Stanford Stadium in Palo Alto, CA. Donated by the Clark family. Item #170: Spring Skiing at China Peak Resort Conveniently located on Hwy 168, just 65 miles northeast of Fresno. Two all-day lift tickets for a day of fun in the snow. http://www.skichinapeak.com $125 Value; Donated by China Peak Resort. Item #171: Golf, Games, Go-Karts & More Four all-day passes to Boomers! Santa Maria. http://www.boomersparks.com/site/santamaria $115 Value; Donated by Boomers! Santa Maria. Item #172: Improve Your Backhand Two 1-hour tennis lessons with Michael Gerard, USPTA-certified Professional. Look athletic in your new Running Warehouse sweatshirt (size L). Also includes a reusable Running Warehouse tote. $150 Value; Donated by Michael Gerard and Doris Kim. Item #173: Family Membership - Avila Bay Athletic Club and Spa + Target Gift Card Sample all of the amenities at this full-service tennis and swim club with state-of-the-art fitness facility. 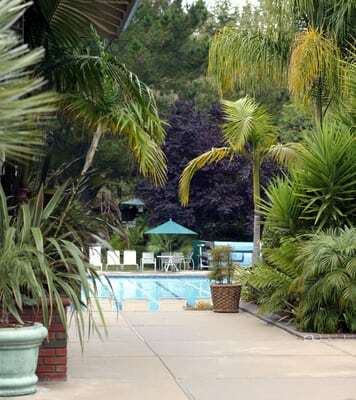 Avila Bay Athletic Club and Spais located on four acres of topical grounds in the heart of Avila Valley. Two week family membership. http://abac.caclubs.com this item also includes a $50 gift care to Target for some sharp new workout clothes. $240 Value; Donated by Avila Bay Athletic Club and Spa. Item #175: California Festival of Beers Grand Tasting Two tickets to sun, fun, music and tasting of beers from over 70 breweries. 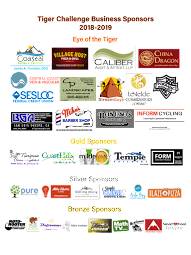 This annual event, which will be held on Friday, May 25 from 5-8 p.m. has moved venues this year to the Madonna Inn Meadows and Expo Center. $150 value; Donated by Hospice of San Luis Obispo County. Item #180: Fused Glass and Ceramic Neclace Beautiful and locally handmade necklace by artist Kelly Feaster of Lean Dog Pottery and Jewelry. The 1 x 1.5 inch pendant with carved ceramic and fused glass inlays joins subtle earth tones of green, beige, taupe and a hint of burnt umber and is complemented by a gorgeous brass open loop chain and sweetheart locket closure. $75 Value; Donated by Lean Dog Pottery and Jewelry. Item #182: Los Osos Fitness + Sylvester's Burgers Enjoy a one month membership to Los Osos Fitness. Reward yourself with a yummy lunch or dinner with this gift certificate for Sylvester's Burgers. You've earned it! Also included is a gift certificate for The Blender - healthy smoothies at Los Osos Fitness. $90 Value; Donated by Los Osos Fitness and Sylvester's Burgers. Item #183: Beach Bungalow Outing and Romantic Dinner Discover warm hospitality in a wonderful, peaceful setting at the Beach Bungalow Inn and Suites in Morro Bay. Your outing includes one night's lodging at this charming inn. www.morrobaybeachbungalow.com Also included is a $50 gift certificate to Windows on the Water and a Day at the Beach Combo from Beach Butlerz - let them do all the work to set you up on the beach in style. www.windowsmb.com www.beachbutlerz.com Plus, enjoy a pound of smoked fish from Ruddell's Smokehouse - a unique and tasty way to enjoy the central coast, as all fish from Ruddell's is straight from local docks. www.smokerjim.com $310 Value; Donated by Beach Bungalow Inn, Windows on the Water, Beach Butlerz and Ruddell's Smokehouse. Item #184: Silk Ties Look smashing in these classic ties. Buy fo ryourself or makes a great Father's Day gift. There's nothing like silk. $40 Value; Donated by the Neumann Family. Item #185: I Want S'more! Don't fool around with inferior campfire equipment - these handcrafted s'mores sticks are just right for making your favorite dessert. One set includes 5 sticks. The two highest bidders win in this Dutch auction. $100 Value; Donated by Mitchell Neumann. Item #186: Energies Rising - One Hour Massage Experience one hour of Laura Gholson's therapeutic massage, incorporating energy work as well. A great gift for yourself or someone you love. www.energiesrising.net $100 Value; Donated by Energies Rising Center. Item #187: Drama Summer Camp The Acting Out! Camp by Academy of Creative Theater will be a whole week of theater games, impfovisation, and acting exploration for our young performers. Students wille xplore text and their imaginations to create characters and understand the basics of acting. The campp will conclude with a fun performance for family and friends. A perfect introductionto the world of theater! Session is 6/18 to 6/22 and is available for 5-11 year olds. $175 Value; Donated by SLO Little Theater. Item #188: Dodgers Father's Day Watch the Los Angeles Dodgers take on the Chicago White Sox on Saturday, June 16 at Dodger Stadium. You are bidding on four tickets. School will have just ended, and it's Father's Day Weekend...what a way to start the summer! $80 Value; Donated by the Los Angeles Dodgers. Item #189: Art Lessons For the budding artist in your family, here are 4 art lessons at Monart. Each class is one hour, and students can sign up at any time. Choose from a variety of classes to include drawing fundamentals, ceramics and painting. $75 Value; Donated by Monart. Item #191: Cosmetic Counter this item includes a fantastic selection of cosmetics to make any woman feel pretty. Yves Saint Laurent Elle Parfum, 2 bottles of memoir Liquide (Amour Liquide and Soliel Liquide), Benefit Hollywood Glow and 2 bottles of Guerlain Terra Cotta Bronzing Powder Mist. $380 Value; Donated by Marie Neumann. Item #192: Purse Accessories Keep organized with this clever lever that holds your purse at any table. No more having to leave your purse on the dirty floor, hanging from a chair or unattended on a coat rack or hall tree. Neat and tidy, the Lennace purse hanger fits right in your purse. Also included is this cute Penhalgion's key fob with a zippered leather coin pocket. $50 Value; Donated by Marie Neumann. Item #193: Chanel Paris Two stylish Chanel charm necklaces come with a Gorham crystal jewelry dish. Also included is a sleek, black crystal perfume bottle. $200 Value; Donated by Marie Neumann. Item #194: Sake Set Serve sake properly warm with thie 5 piece ceramic Sake set. The set includes four sake cups and a ceramic sake carafe. $40 Value; Donated by Marie Neumann. Item #195: Derma Sweep with IPL (Microdermabrasion) Enjoy the newest in microdermabrasion treatments with this Derma Sweep with IPL. Stimulate and regenerate your skin with a gentle abrasion to remoe the dead, outer layer of skin and reveal a newyou! Intense Pulsed Light technology can be used to help restore the skin's youthful appearance. IPL technology improves the appearance of photoaged skin, removes age spots (sun-induced freckles), most benign brown pigment, and redness caused by broken capillaries through a process called photorejuvenation for face and body. www.moatslaser.com $300 Value; Donated by Dr. Michael W. Moats, Moats Laser & Skin Care. Item #196: Shift Salon - Haircut with Lauren In a modern world where life moves fast, we need to continuously SHIFT our focus and re-invent ourselves. Lauren Heiden is a stylist and color specialist. Let her help you re-invent your look in the soothing environment of Shift Salon. www.shifthair.com $55 Value; Donated by Lauren Heiden, Shift Salon. Item #197: Shift Salon - Haircut with Roberto In a modern world where life moves fast, we need to continuously SHIFT our focus and re-invent ourselves. Join Roberto Norcia, an accomplished color specialist, stylist and salon owner with a world of experience, to re-invent your look in the soothing environment of Shift Salon. www.shifthair.com $55 Value; Donated by Roberto Norcia, Shift Salon. Excited? Want to see everything (and more!) in person? Come to the Auction!